The Lapis Lazuli (Hen) Egg is made of lapis lazuli, gold, blue, white and yellow enamel, pearls, rubies and diamonds. For a long time it was assumed that this beautiful Egg was one of the Imperial Easter Eggs. Research however, proved that there is no place for this Egg in the series of Imperial Easter Eggs. The Egg has no visible Fabergé markings. 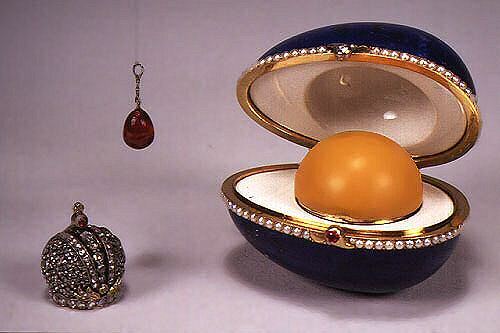 The Lapis Lazuli Egg is very equal to the 1898 Kelch Hen Egg. Not much is known about the backgrounds of this Egg. Maybe it was made for one of the other members of the Imperial Family and maybe the future shall place this Egg in the category "Imperial Eggs". In what year India Early Minshall acquired this Egg is not known. In the 1930's there were five major American Fabergé collectors, of which India Early Minshall was one. She acquired this Lapis Lazuli Egg and the 1915 Imperial Red Cross Triptych Egg.